Multi-Currency is used in various places in Spire. 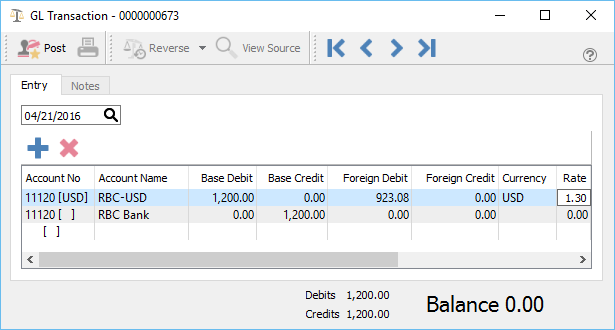 General Ledger – Journal entries can be made posting to foreign and base accounts. NOTE: The base and foreign amounts as well as the rate are editable prior to posting. Purchase Orders – When a purchase order is created the prices are all in the foreign currency. When the PO is received the amounts are posted to accounts payable in the foreign amount. The amounts of the accrued freight and duty are in base. The inventory received gets landed in base an includes the accrued freight and duty. The vendor’s currency is shown on the bottom of the PO. Once items are added to a PO the vendor cannot be changed to a one with a different currency. Sales Order/Invoicing – When creating a sales order for a customer that is set with a foreign currency the prices are either converted using the currency rate unless the customer is set to a sell level that has a currency assigned to it. The exception of this is if there is a ‘Price Matrix’ record for this customer. It will then use that price in their currency. The customer’s currency is shown on the bottom of the sales order. Once items are added to an order the customer cannot be changed to a one with a different currency. Point of Sale – Acts the same way as sales orders.